The average cost of memory care in Johnson County is $5,025 per month. This is higher than the national median of $4,650. Cheaper nearby regions include Linn County with an average starting cost of $4,934. Caring.com has helped thousands of families find high-quality senior care. To speak with one of our Family Advisors about memory care options and costs in Johnson County, call (855) 863-8283. Johnson County has a little less than 150,000 residents, over one in 10 of whom are aged 65 and over. While Alzheimer's disease and dementia are not as prevalent here as in the state and nation, the Centers for Medicare and Medicaid Services still project that 9.5 percent of seniors who receive Medicare benefits are living with this diagnosis. Johnson County is home to four memory care facilities. 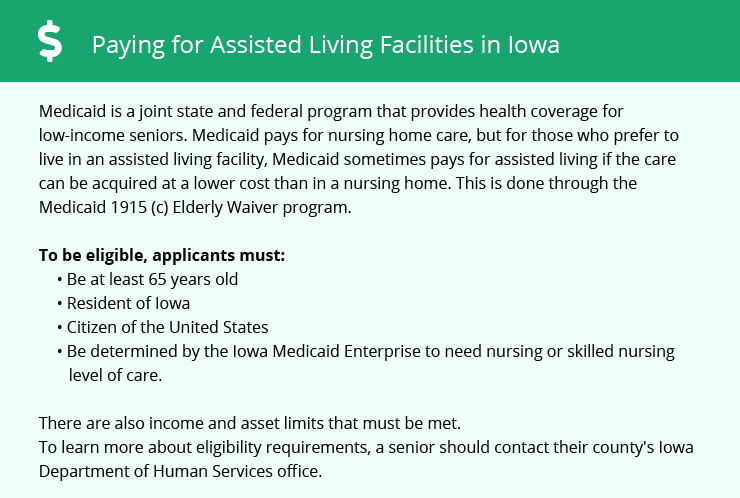 In this county, as in all of Iowa, memory care may be provided in an assisted living program that is certified as a dementia care unit or in a standalone facility that primarily serves residents with dementia. Johnson County seniors pay state income tax on most forms of retirement income, but residents aged 55 and over qualify for a deduction to lower this expense. Social Security benefits and public pensions are not taxed, which may let seniors and families put more money toward local memory care services. According to data published by the American Lung Association, particle pollution levels in Johnson County are low, which may benefit seniors with respiratory illnesses or cardiovascular disease. The county was given a B for short-term particle pollution and a passing score for annual particle pollution. Overall, crime in Johnson County is roughly on par with the national average, which may make it a good option for families seeking a safe community for memory care services. On a 100-point scale on which a higher score indicates more crime, violent crime is rated 32.9, versus the national median of 31.1, and property crime is rated 37.1, versus the national average of 38.1. Johnson County is a relatively expensive place to live, which may be a consideration for seniors and families with limited memory care budgets. The overall cost of living in here is about 12 percent higher than the state median and 2 percent higher than the national median, and healthcare expenses are about 4 percent higher than the state median and 22 percent higher than the national median. Memory Care costs in Johnson County start around $5,025 per month on average, while the nationwide average cost of memory care is $4,798 per month. To see a list of free memory care resources in Johnson County, please visit our Assisted Living in Iowa page. Johnson County-area assisted living communities must adhere to the comprehensive set of state laws and regulations that all assisted living communities in Iowa are required to follow. Visit our Memory Care in Iowa page for more information about these laws.